Home Buyer's Guide Apple Ecosystem MacX MediaTrans Review: Best iTunes Alternative for Mac? It has all the features of iTunes and includes a lot more in the package. The interface is clean and intuitive though it seems a bit dated. Before using MacX MediaTrans, we used to go through a painful process of moving music and other files to iTunes to sync them to iTunes and iPad. MacX MediaTrans eliminated the middle step and made the whole thing look easy. If you happen to own an Apple device you will know that every time Apple rolls out a new update, it advises people to back up their data to avoid any data loss accident. It is a common practice by many manufacturers and should be followed instead of regretting later. The storage capacity of the iPhones, iPads, and Macs has improved a lot over the years allowing us to compile and save our data. But sometimes the free iCloud storage capacity is not enough and many turn to their Mac as the primary backup options. But many complain that iTunes is slow, especially for large backups. This is where MacX MediaTrans come into play. In this article, we will be reviewing the software to see if it is really the best iTunes alternative. MacX MediaTrans is a data management software for your Apple devices like iPhone, iPad, and iPod. It goes beyond the iTunes features and gives you extra flexibility in copying your media to and from your iOS devices. You can directly copy various media and files types between your iPhone, iPad, and Mac without the need of iTunes. It allows easily managing all devices and moving things around with just simple swipes and taps. This makes it perfect to back up things that are taking up space on your iPhone and iPad and move them to Mac. With MacX Media Trans you can later move them back to your devices when needed. You can abbreviate it as your iPhone manager. MacX MediaTrans supports iPhone, iPad or iPod that is running iOS 7 or higher, Mac OS 10.7 or higher and iTunes 11.2 or higher. You should always check out the features before purchasing any software. Considering how a lot of people will be using MacX MediaTrans as a direct replacement for iTunes, it is important to go over the features and check it out. Allowing users to back up their data is one of the most important features in an iPhone manager. If you own an iPhone or any other iDevice for that matters, you will need to back up your files at some point in time. MacX MediaTrans does the work perfectly, regardless of the file type. After you initiate the backup you will be given a list of file types to choose from. You can either select every file type supported by the tool or make a selective decision. Its entirely based on your performance and works out just fine. One of the most used features in iTunes is for backing up your music files. Since you will be planning to replace iTunes with MacX MediaTrans, you should know its capabilities. MacX MediaTrans allows you to manage your music without any issues. You can import, export, create, delete, edit the playlists, and make modifications to artists as well as to the albums and genres. There is even the option to create ringtones for iPhone though it works only for iPhone 8/8s and later iPhones. We all have important files on our system that we do not want anyone else to access. MacX MediaTrans allows you to encrypt the file of your choice without having any issues. The process is easy and straightforward and you will get the hang of it after the first time. If you are worried that your files might be misused, simply encrypt them with MacX MediaTrans. You can compress video formats like AVI, FLV, and MKV and convert them to Apple-compatible formats that take up to 50% less space on your devices. MacX MediaTrans allows you to specify file sizes to better manage movie storage. Photos are presented as thumbnails along with all of your albums making it easy and quick to find your photos. 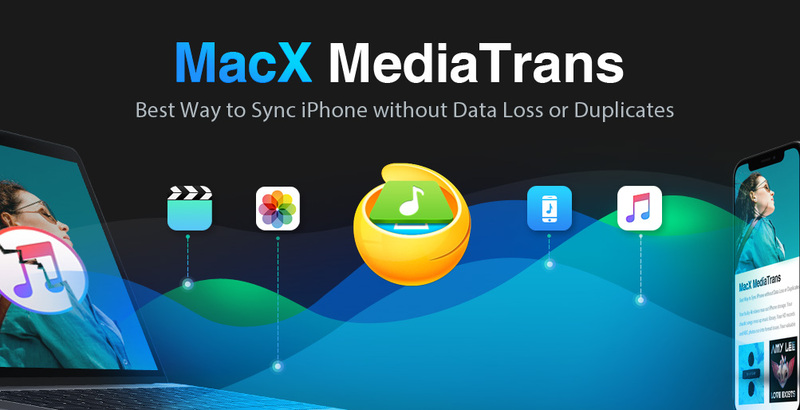 MacX MediaTrans allows you to easily use your device as a flash drive. If used properly, it can do wonders allowing you to carry a huge amount of data from one place to another. However, the other system that you are carrying the data to should also have the same software, because otherwise, this feature will not work. Despite knowing the features of MacX MediaTrans, we are offering a comparison between it and iTunes to know the advantages. When using iTunes, people might be frustrated over device recognition failure, complicated operation, time consumption, sync errors like data loss or other problems. On the other hand, MacX MediaTrans MacX MediaTrans offers a two-way sync without the need for a Wi-Fi connection. MacX MediaTrans allows transferring files like music, ringtones, audiobooks, iBooks, video, movie, TV shows, photos, iTunes purchase, a podcast from iPhone/iPad to Mac/PC compared to iTunes. MacX MediaTrans even allows you to sync non-Apple video and audio to your iDevices like FLAC, WAV, OGG, MKV, VOB, FLV and more. There is auto-convert option to convert non-Apple video and audio formats to iDevice supported formats during sync. It automatically reduces big-size files to save space in iPhone while there is no such feature in iTunes. There is no option to delete photos in iTunes and turn music songs into iPhone ringtone. iTunes also lacks the option to encrypt and remove DRM protection from iTunes purchases. There is also the problem of encountering iTunes sync error. Take a look at some of the most annoying failures and solutions to fix them. We faced no issue in installing MacX MediaTrans. The UI is simple and icon designs are in-line with iOS applications. It has buttons for Photo Transfer, Music Manager, Video and Flash Drive along with eBooks and Ringtones icons in the dashboard. The left side contains all the groupings of your data on your iDevice. The top includes the function including addition, deletion or exporting. Since MacX MediaTrans allows more than just transferring of photos, we would be looking at some other features. To transfer photos, follow the following steps. After installing, launch it and you will be asked to properly set your iTunes in case your data gets lost. Don’t think much about the warning; it is just to ensure that you have backups in place already. Click the photo icon, and you will see all the photos from your Camera Roll. Select the photos you want to transfer to your Mac or you can just drag and drop. 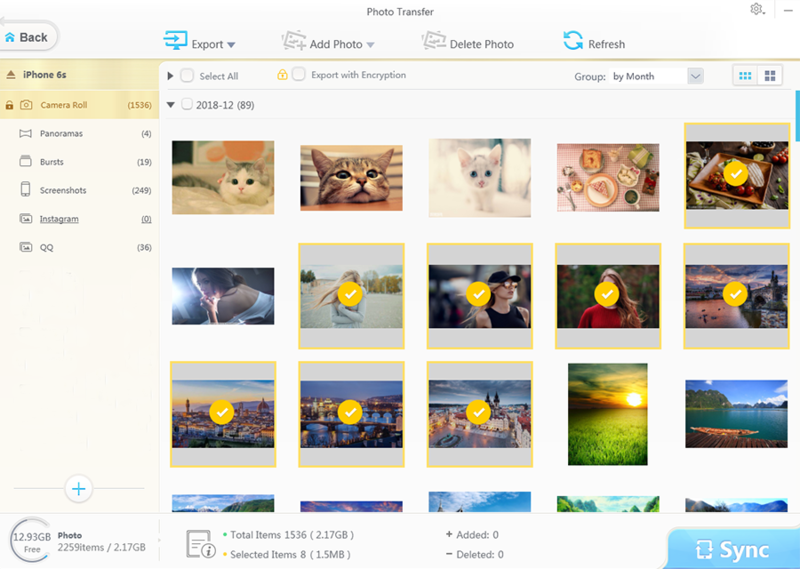 You also have the option to export all photos, export selected photos, or export photo albums. After clicking on the desired export button, your photos will be directly exported to your computer. You can use this feature to export as many photos as you want without any issues. It is much simpler and quicker than the default method provided to you by iTunes. If you want to transfer music instead of photos, the process is almost the same. The difference will be the time since the music files are on the bigger side as compared to photos. Since you have already installed the software, you only need to launch it. Connect your phone with your Mac. You will able to see the music library which will be divided by the different sections you have created. 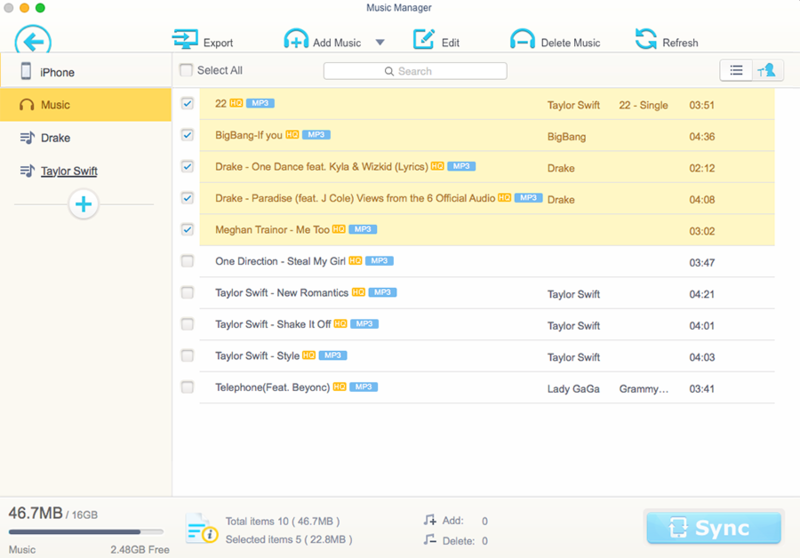 Simply, choose the music that you want to export and select Export. You can further click on Add music to add new songs. After using the MacX MediaTrans tool, we can say it is one of the best, if not the best iTunes alternative and iPhone manager for Mac. It has all the features of iTunes and includes a lot more in the package. The interface is clean and intuitive though it seems a bit dated. Before using MacX MediaTrans, we used to go through a painful process of moving music and other files to iTunes to sync them to iTunes and iPad. MacX MediaTrans eliminated the middle step and made the whole thing look easy. We also loved the fact that MacX MediaTrans includes one-click bulk deletion of all or multiple photos from the album. If you want to try these features you can use the software for a 15-day free trial or purchase with a 30-day Money Back Guarantee from the MacXDVD website. If you are looking for the perfect iTunes alternative, then we cannot think of a better option than MacX MediaTrans. Previous articleVeePN Review: Key App for Your Internet Security?